Republicans cannot be shamed into ending tax cuts. The GOP turned its back on fiscal stability in the late 1970s and has yet to pay a price. Anyone who says that Democrats ought to just talk about this some more is telling you to bang your head against a wall: “starving the beast” is the only remaining achievement of Republican governance in its last decade. They are not giving up that “achievement” without a fight. For his part, the president will be happy to campaign against those billionaire tax cuts in 2012 because the issue is a winner for him. It already has been; he campaigned on it. If the blogosphere intended to teach Democrats to be tougher this cycle, then it has failed miserably. Please spare me your Grayson-Kucinich 2012 fantasy: the country is centrist, even if the center does not hold. Sounds great! Can they get to sixty this time? Will it be enough for the House, which has to pass a bill first? I hope so. I would like to see Congress do better than they already have done, but they are already in extra innings and a protracted fight is risky. 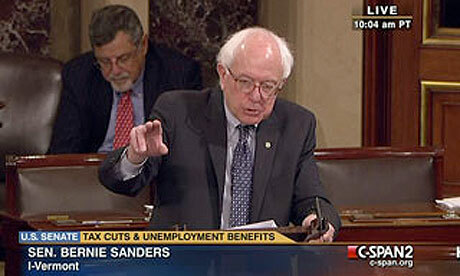 Sanders spoke for a very long time, and well; but that was eight hours without an unemployment extension. If there is no deal before Congress leaves Washington for Christmas, it will land like a punch in the economy’s gut. Republicans would paint Democrats with their own colors once again. We’ll all know they’re projecting, but it won’t matter when homelessness shoots up, urban and suburban blight accelerate, and all manner of service agencies deal with the sudden flood of newly-needy, many of them formerly middle class. Nothing in the scenario where tax cuts expire, the unemployed are cut off, and things get worse in America is necessarily bad for a shameless opposition party. Turnout by Obama voters is actually suppressed by a bad economy. Furthermore, the “rational middle” — where all politics are truly local — has disappeared with the return of paranoid politics amid hard times. Increased crime will only exacerbate the social tensions that feed reactionary politics. Republicans will not only experience no shame, they will cast that shame on their enemies. They always do. If the GOP had a conscience, David Vitter would have resigned instead of running for reelection. From torture to C-Street to birther pandering, the party has never shown any shame for crimes committed in its relentless pursuit of power. All hypocrisies are rationalized away. That is not a description of Firebagistan. That is a party that will reject a primary challenger, and will in fact lose its base in 2012 if Obama is not on the ticket. Put another way: Harry Reid is still in charge of the Senate because Nevada Republicans(!) chose him over Sharron Angle, but Nancy Pelosi is no longer in charge of the House next January because Democrats didn’t show up on November 2nd. Pelosi has spine; Reid doesn’t. What sort of signal do you think Washington Democrats get from that? Self-described progressives keep saying that Obama hasn’t talked about Republican intransigence enough, but he has. Shame simply has no effect on the shameless. Their demand that any unemployment extension be conditional on billionaire tax cuts is unprecedented, but Republicans had no shame making the demand. What makes anyone think the GOP wouldn’t hold funding for other vital programs hostage, too? Democrats in Congress could have had this fight pretty much at any time this year. The January first deadline for action was no secret to anybody. Even with the heavy schedule of other important things Congress got accomplished this year, from roughly the beginning of the summer onwards this fight could have happened any time Harry Reid and Nancy Pelosi wanted it to. They could have used it as the centerpiece of the midterm election season. They could have had plenty of time to fully debate everything, allow the White House to get on board with a few veto threats, and taken their case to the American people. Let me just repeat that, in case you missed it — Democrats in Congress did not have this debate. They punted. They decided that they’d take care of it after the election, rather than using the issue in the campaign. Largely, this was due to nervous Democrats (Blue Dogs, for the most part), who balked at “raising taxes” during an election. Most of the Blue Dogs wound up losing anyway, I should point out. But for whatever reason, Democrats caved into political cowardice rather than doing their job in a fashion that left plenty of time for haggling in full display of the voting public. Congressional Democrats created this crisis through timidity. The election has made them even more timid. Radicals who reject the president’s deal are pinning their hopes on these same Democrats. You’ll excuse me if I don’t hold my breath; shame only works on those who feel it, and shaming Democrats has proven empirically unsound as a strategy.